Online purchase: Visitors can purchase tickets on the official Wechat which is ‘Power Station of Art’. Students and Teachers: Students (excluding part-time students) who are registered in mainland China holding student ID or ISIC international student ID, and teachers holding teacher ID are eligible for 50% off of the original ticket price. Groups: Groups which is more than 20 people ( inc 20 ppl) are eligible for 60% off of the original ticket price. ＊Discount tickets can be purchased on-site and online (official Wechat), please bring relevant ID when visiting the Power Station of Art. 2. International Council of Museums (ICOM): Members of the International Museum Association can visit for free with valid ICOM documents. 3. Weekly Free Day: Every Tuesday is free entry for all visitors. Metro: Exit 2, South Xizang Road Station (Line 4 and 8). Walk straight to Nan Chezhan Road and turn right, and continue to Huayuangang Road (approximately 15 minutes). Alternatively exit the station and walk straight to the "South Zhongshan Road / South Xizang Road" bus station and take Bus 1212. 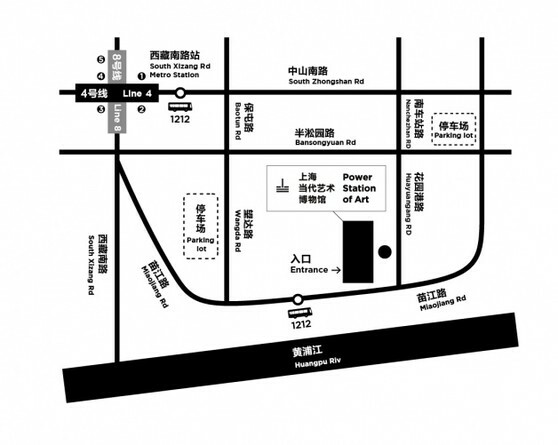 Bus: "Miaojiang Road/Wangda Road (Power Station of Art)"
Station, Bus 1212; "South Zhongshan Road /South Chezhan Road" Station, Bus 45, 66, 109, 144, 306, 327, 780, 869, Bus 6 Daqiao, then take 10 minutes’ walk. Car: Take South Xizang Road exit from Inner Ring Road Overpass, then turn right to Nan Chezhan Road and drive to the end (Huayuangang Road). Driving from Xujiahui is approximately 25 minutes. Little Bee Tours by primary and secondary school students: 13:00-16:00 every Sunday, in the exhibition hall. Please set your cell to vibrate only.